So you’re in need of a first suit, and you’ve decided to go custom. You’re off to a great start. But the decision-making process is just getting started. The ability to choose everything from fabric to lapel style is one of the things that make custom clothing so enjoyable. But it’s also easy to get lost amid the options, and a process that should be fun can quickly seem daunting or fraught with indecision. To keep that process going smoothly, we’ve decided to tackle some of the most common questions below. A first suit is not like other suits. Whether you work in a profession that requires you to wear one to work each day, or only see yourself suiting up for weddings and special occasions, you’ll want something with maximum versatility. We love a windowpane or herringbone pattern as much as the next suit appreciator, but in this case we’d strongly advise you to keep it solid. Solid suits will prove easier to pair with shirts, ties and other items in your wardrobe, and are generally more formal than patterned suits, ensuring that they can be worn in professional, formal, or somber settings. Yes, solid suits will “blend in” to the crowd a bit more than patterned suits. But if you’ve got just one suit in your arsenal, that’s exactly what you want. If a plum glen plaid suit is worn four times in one week, its repeated wear will be noticed. But a solid navy suit can be worn in repetition with much more subtlety. As we may have hinted above, we’d also advise hewing to the darker side of the spectrum for your first suit. Just not as dark as black, which as a flatter color is much less versatile than a navy or charcoal suit. 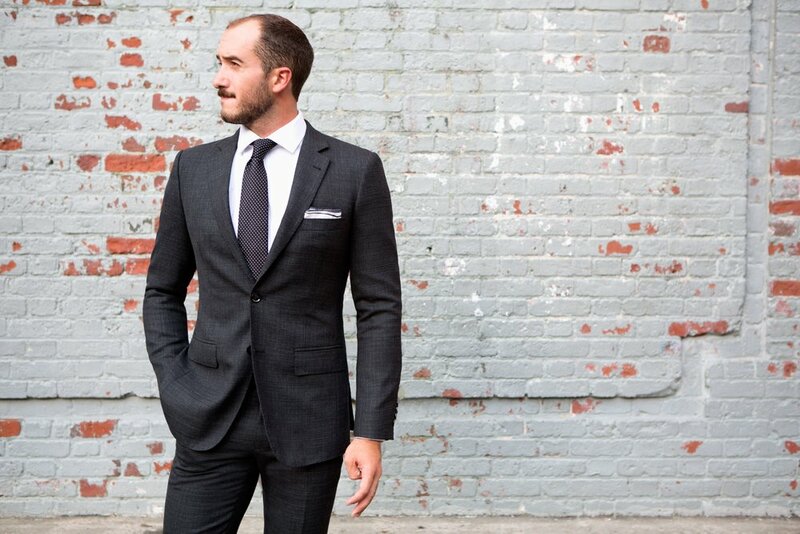 Any suit in navy or mid-to-dark grey has enough formality to be worn to job interviews, weddings and funerals. All three of these scenarios require a suit, so if you’ve got just one to work with you’ll want to make sure that it can check all three boxes. Double breasted suits are more rare than single breasted, and that factor—alongside their distinct button arrangement—makes them stand out. We’re big fans of double breasted suits, and we love to see their unique style embraced. But it’s those same unique factors that make double breasted suits slightly less versatile than their single-breasted cousins, so for that first pick we recommend sticking to the latter. We hope this advice makes for smoother sailing along your journey to that first suit. And if you’ve got a soft spot for bold patterns and jewel tones, don’t let it fade away. Just save it for your next selection.